Around 40% of University of Kent's international students are from mainland Europe. While studying or working at Kent there are a wide range of European opportunities available to you. These range from studying programmes or modules with European features or research angles, to mixing with a diverse European and international community. Kent staff can apply for funding to undertake two to five days' training/teaching opportunities at our Erasmus partner universities, or other relevant organisations within Europe. Kent’s cosmopolitan atmosphere is generated by a large number of international students, around 40% of them from Europe. 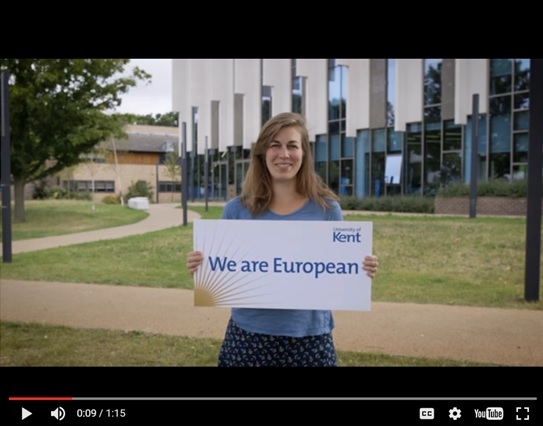 The European community at Kent makes up a large and valued part of our annual student intake. In the academic year 2017-18, there were over 2,100 non-UK European students from 44 different European countries. European students make up roughly 12% of new students, about 15% of postgraduate students. Kent is an active participant in the Erasmus programme, exchanging some 500 students per year with our European partner institutions. All our partners are chosen for their academic standards and for their courses, which complement studies at Kent. Kent’s partners include highly prestigious universities, several of which are ranked within the top 100 institutions in the Times Higher Education World University Rankings. Visit one or more of our European Centres in Brussels, Paris, Athens and Rome. This could be through a postgraduate degree, a summer school or just a day trip! Learn from leading academics. 40% of our academic staff are from outside the UK, so you can learn from a diverse range of perspectives and subject areas. Discover different cultures. Kent attracts staff and students from across the world, creating an atmosphere of cultural exchange that all members of the University can benefit from. The University calendar is full of multi-cultural events for all. You can also join one of the many cultural societies at Kent. Explore Europe. We are well positioned to serve as a global gateway to Europe. So while at Kent you will be able to visit a range of European countries. Study or work abroad. There are many opportunities to study or work abroad as part of your degree. Take a look at the exchanges and placements available. Learn a language. There are more than 11 languages available to study in a range of different modes at Kent. As a globally-focused institution, and the UK’s European university Kent, attracts employees from all over the world. Currently, 40% of Kent’s academic staff are from outside the UK, wth 24% coming from mainland Europe. This wide range of experience and culture benefits the University with an enriched opportunity for diversity across both our teaching and research portfolios. Given the international make-up of our staffing, our human resources team work on improving the support and range of knowledge that we have in order to improve the overall experience for international staff who work here. Our experience now also extends to the support of the staff involved with the academic provision and support systems at our European centres in Brussels, Paris, Rome and Athens. The EU Partnership Fund has been established to encourage staff to build on the University's relationship with Europe. The fund supports a broad range of partnerships including both purely academic collaborations and those with enterprise, government or charities. Human Resources has provided specific information for staff members seeking HR related information post-EU referendum.